The year 2018 is turning out to be Vanuatu Aquatics Federations biggest year to date and a year of firsts. Since starting in 2014 with a grassroots development program, the Federation has established a national team under the guidance of our new head coach Carol Macgill. Carol has over 15yrs experience coaching swimming and has been living in Vanuatu for the past 5 and has had an integral part in helping swimming in Vanuatu progress. Mrs Macgill is very proud to be the first Vanuatu Head Coach with her passion for swimming extending through all the swimmers who train with her. 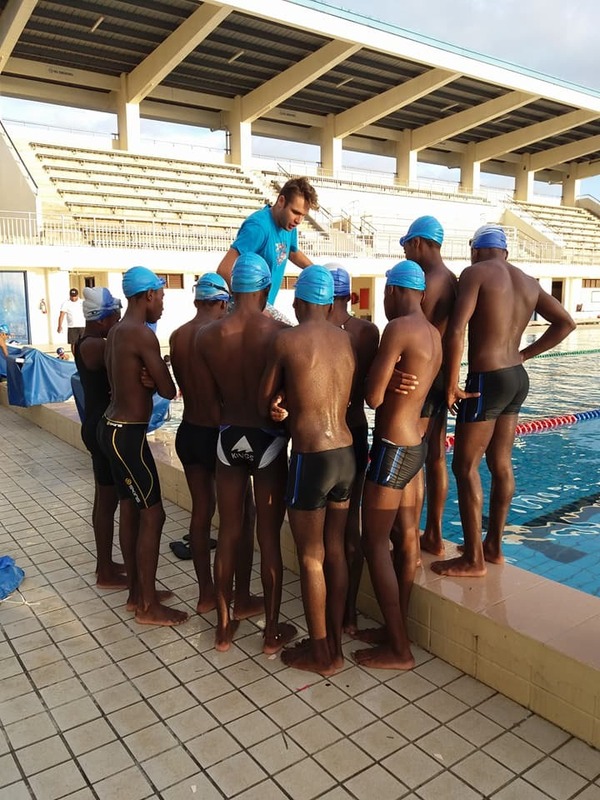 On April 7th the Vanuatu Swim Team headed to Fiji for their first ever overseas tour and compete in the Fiji Long Course Grand Prix at Damodar Aquatic Centre. The team was made up of 8 boys and 1 girl. 8 swimmers have come through the Let’s Swim learn to swim curriculum and are now representing their country for the first time. It is a very proud moment for Vanuatu Aquatics Federation as a lot of time and effort from a small group of very committed and passionate volunteers have worked towards this goal. The team of 9 swimmers along with Carol and VAF’s Senior Development Cfficer Frank Vira as Team Manager flew into Nadi with the support from Air Vanuatu and took the 4 hour bus ride into Suva – the longest car ride many of the team have been on - to make it to Johanna Mitchell from the Dolphins Swimming Club who had organised a team of welcoming and understanding swimming families to help billet our team. Everything was new for our team. The week gave our athletes the chance to train with Douglas Miller with the Dolphins Club in a 50m Olympic pool for the first time; jumping from starting blocks and having 2x2 hour training sessions in cold fresh water – it was a shock to all! It was great to finally record times for the team, which will be used in considering selections for the PNG Oceania Championships. Vanuatu is aiming at sending 4 swimmers to the Championships to showcase our up and coming talent. This will be another first for Vanuatu Aquatics sending swimmers to an Oceania Championships. A super special thanks has to be given to Johanna and the Dolphins for organising an amazing week full for our team whom had never left Vanuatu before. This was the perfect learning experience for our entire team (Swimmers, coach, board and volunteers) before we head to Port Moresby and the Oceania Championships in June. Until then the Vanuatu Aquatics Federation will be working on our outreach program, monthly open water competitions, Aqua Aerobics program for all girls and women, and preparing for our big water polo events in July. Vanuatu is hosting a FINA Water Polo Clinic from the 3rd - 6th of July followed by our Azure International 5’s Water Polo Tournament on Saturday 7th.